Over the past several decades and even more so over the past several years, there has been a strong focus in the medical community and health care industry to reduce medical errors. Medical errors not only increase health care costs, they often also result in costly litigation. Health care centers, providers, and hospitals are heavily regulated. The Joint Commission on Accreditation of Healthcare Organizations (JCAHO) is an independent organization accredits and certifies nearly 21,000 health care organizations and programs in the United States. Joint Commission accreditation and certification is recognized nationwide as a symbol of quality that reflects an organization’s commitment to meeting certain performance standards. According to John T. James, PhD, patient safety advocate, errors are underreported in studies since the tools used to evaluate data miss errors of omission, those not found in the medical records, diagnostic errors, errors of context, and errors of communication. In addition, there is not even an agreed upon definition of what constitutes a medical error. Healthcare in the United States is complex, with an overwhelming amount of new knowledge becoming available each year. In the Journal of Patient Safety, Dr. James categorized the cause of preventable adverse events in hospitals as: Errors of commission, Errors of omission, Errors of communication, Errors of context, and Diagnostic errors. This module, Medical Errors, will explore three patient safety concepts: (a) quality control, (b) sentinel events, and (c) root cause analysis as described by the Joint Commission. Eight common sentinel events will be discussed, followed by the nurse’s role and responsibility in preventing medical errors. Quality control (often called QC) is a procedure/set of procedures followed to ensure that a product or service adheres to a defined set of quality criteria and/or meets the quality requirements of a client or health center. The Institute of Medicine in 1999 produced a landmark report “To Err is Human; Building a Safer Health System” that made healthcare institutions become acutely aware of the number of medical errors occurring annually and the need to begin to do something about patient safety and quality. In 2005, the Patient Safety and Quality Improvement Act was created in response to the public’s concern around patient safety. The Act established a voluntary reporting system for data collection in order to assess and resolve patient safety and health care quality issues. the United States only falling behind heart disease and cancer. This debate about the prevalence of the problem is fueled by inaccurate reporting methods, voluntary nature of reporting, varying definitions of medical errors, and the fact that many errors occur in multi-step processes rather than as single incidents. Agreement exists about the fact that the risk of a patient experiencing a preventable medical error is not acceptable. Preventing medical errors has become a priority for health care institutions, regulatory bodies, professional organizations, consumer organizations, and insurance companies, among others. The increase in collection and distribution of knowledge as well as highly-publicized cases of medical errors has led to the establishment of an internal heightened awareness of the incidence of errors and an increased public concern about their safety within the health care delivery system. Medical errors which are considered preventable are labeled sentinel events. Errors that do not result in harm have been identified in literature as “near misses”. Actively engaging the patient and family members in decision making about care. The 11 tenets of a safety culture describe an organizational culture that emphasizes self- assessment, quality and safety improvement, open communication, and freedom to report unsafe conditions and events without intimidation or retaliation. The Joint Commission publishes Sentinel Event Alerts which identifies specific types of sentinel and adverse events and high risk conditions. This publication describes underlying (root) causes and recommended steps to reduce risk and prevent future occurrences. This provides organizations with guidance when designing or redesigning processes. A sentinel event was introduced by the Joint Commission to help hospitals that have experienced a grave patient safety issue(s) to protect the patient, improve the system, and prevent future harm to patients. A sentinel event is one type of an adverse event which signals the need for an immediate response. A sentinel event is an unexpected occurrence involving death or serious physical or psychological injury, or the risk thereof. Serious injury specifically includes loss of limb or function. The phrase "or the risk thereof" includes any process variation for which a recurrence would carry a significant chance of a serious adverse outcome. Such events are called "sentinel" because they signal the need for immediate investigation and response. A sentinel event is “not related to the natural course of the patient’s illness or underlying condition”. Patient acuity, dependence on medical technology, reduced lengths of stay, and the shortage of nurses and other healthcare workers may all contribute to a sentinel event occurring. Hospitals frequently find a breakdown in communication across disciplines regarding a patient’s plan of care a leading cause to a sentinel event. Most sentinel events are the result of a system related problem and not a mistake of a single individual. A sentinel event is often the outcome of several root causes. The Joint Commission requires all accredited hospitals to define sentinel events for their institution. The definition is expected to be communicated to all departments within the facility and services associated with the institution. Reporting of a sentinel event by the hospital to the Joint Commission is voluntary. The Joint Commission also learns about the occurrence of a sentinel events through complaint avenues. 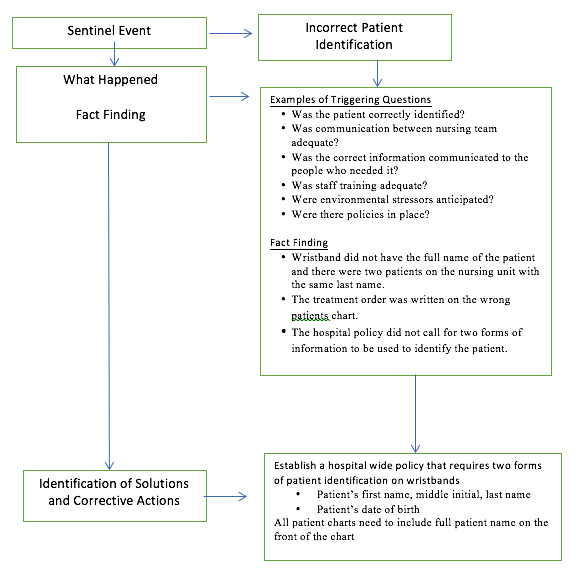 When a sentinel event has been identified, the hospital is expected to respond in the following manner: stabilization of the patient; communication to the patient and family concerning the event; notification of the hospital leadership; investigate the incidence, complete a route cause analysis, develop a corrective action plan with a time line for implementation and show improvement. The method for analyzing errors to accurately identify safety improvement measures is called a root cause analysis. The root cause is a problem or factor that, when eliminated in a sequence of problems or faults, prevents the adverse event from occurring. Often this is not the factor identified at the initial examination. 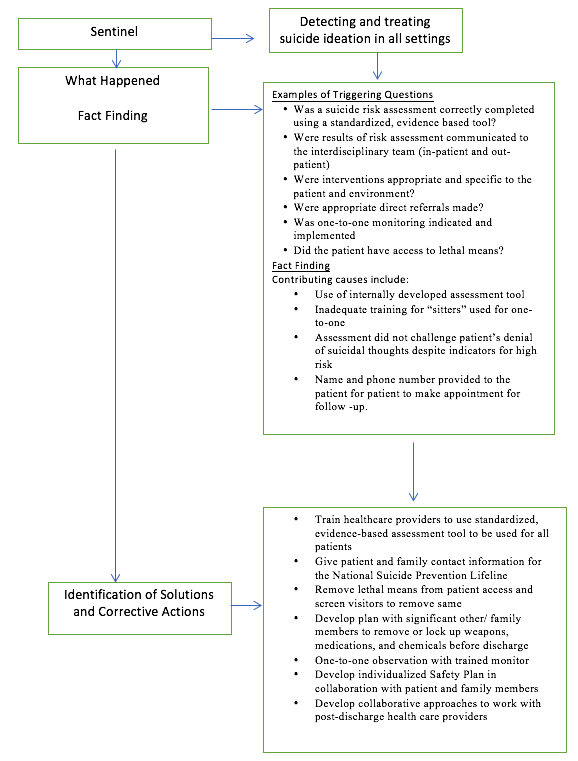 The Joint Commission publishes a Framework for Root Cause Analysis and Action Plan in order to provide an example of a comprehensive systematic analysis to health care organizations. The framework provides assistance by outlining the steps and information needed in a root cause analysis in order to analyze an event for quality improvement. Since 1997 Joint Commission has mandated that seminal events be analyzed by using RCA and 27 states have mandated reporting of such events. The focus of RCA is to determine the underlying problem of systems and processes that lead to an error, which results in temporary or permanent harm or even death of a patient not related to the patient’s illness or primary condition. When a RCA is performed the emphasis focuses on the underlying cause of the event and not the individual. A pre-determined systematic procedure is initiated to collect information and reconstruct the event through questioning the individuals involved, reviewing the records, than analyzing the reason why the event occurred. The primary aim of RCA is to identify the factors that resulted in the negative outcomes of one or more past events to identify what needs to be changed to prevent future events. RCA is performed by a team systematically as part of an investigation, with conclusions and root cause(s) supported by documented evidence. There may be more than one root cause for an event or a problem. All possible solutions to a problem are identified to prevent future events at the lowest possible cost and in the simplest possible way. The RCA should determine a sequence of events or a timeline to understand the relationships between the root cause(s) and the event to prevent it from happening in the future. Root cause analysis reduces the frequency of events that occur over time within the environment where the RCA process is used. RCA uses the 5 “whys” to get to the bottom of the situation (asking why 5 times to get to the real root of a problem). In order to reduce the incidence of medical errors, their causes must be correctly identified and fixed, and the success of improvement efforts must be measured. Exact measurements of the problem, must be based on clear and consistent definitions in order to be useful in reducing incidence of these sentinel events. Data collection and subsequently solutions to eliminating related errors is hindered by differing definitions which reflect the variety of purposes for which data is collected and used, such as research, insurance, legal actions, law making, ethics, and quality control. The wide variety of words used to describe errors results in difficulty making a true comparison of error rates in the published literature. Adding the definition of near misses into the discussion would further complicate the issue, but should not be overlooked as this focus could add to the data on the prevention of errors and quality improvement. Stephen Austin, 51, went to the emergency room with symptoms of anaphylaxis that included facial swelling and thickening of his tongue. He had eaten walnuts about thirty minutes earlier but had no prior history of a nut allergy. In the emergency room he received 3.0 milligrams of epinephrine. Following the injection Mr. Austin experienced chest pain and difficulty breathing causing him to collapse and die. Why would this situation be considered a sentinel event? Describe the root cause analysis that would have been implemented by the hospital? Who in the organization should be involved in the effort to correct the situation? Healthcare-associated infections (HAIs) are signification causes of infections within all types of healthcare institutions. They are considered to be the most common complication of hospital care. A healthcare-associated infection is an infection that a patient gets while receiving treatment for another medical or surgical condition. These infections are associated with increased health care costs, extended hospital stays, and medical complications and patient deaths. Several organizations such as the Center for Disease Control (CDC) and the Joint Commission have made significant progress in preventing specific healthcare-associated infections. Catheter-associated urinary tract infections (CAUTIs), surgical site infections (SSIs), and multidrug resistant organisms are three common types of healthcare-associated infections. Surgical site infections (SSIs) occur at the site of surgery. The Center for Disease Control (CDC) has identified 3 types of surgical site infections (1) Superficial incisional infection, an infection that occurs just in the area where the incision was made; (2) Deep incisional infection, an infection that occurs in the muscle and the tissues surrounding the muscle beneath the incision; (3) Organ infection, an infection in any area of the body, a body organ or a space between organs. Infections following surgery are most commonly caused by bacteria. Bacteria can infect a surgical site through a contaminated caregiver, surgical instruments, and/or bacteria already on the patient’s body. Multidrug-resistant organisms (MDROs) are bacteria that are resistant to more than one antibiotic. This makes certain healthcare-associated infections difficult to treat. This phenomenon occurs when an individual takes antibiotics for a long period of time or when an individual takes antibiotics that are not necessary. Multidrug-resistant organisms can be spread by hand contact or contact with equipment or surfaces that have been contaminated. Infections occur most frequently in patients that are older, have a compromised immune system, have repeated hospitalizations, or have had surgery. Although treatment with antibiotics is difficult once the type of multidrug-resistant organism is identified it can be treated with specific antibiotics. Any of the above healthcare-associated infections can lead to a sentinel event causing the healthcare organization to implement a root-cause-analysis to determine the cause(s). 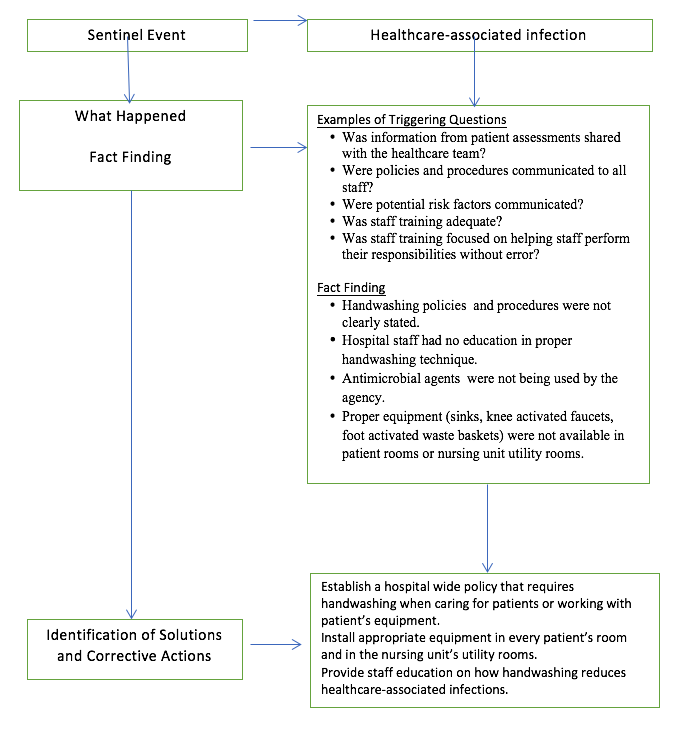 The following diagram depicts an example of a root-cause-analysis as identified by the Joint Commission Sentinel Event Alert #28 for decreasing healthcare-associated infections. One of the most important ways to prevent healthcare-associated infections is by employing hand hygiene by all healthcare providers regardless of healthcare setting. The National Patient Safety Goals requires compliance with either the Center for Disease Control (CDC) or the World Health Organization (WHO) hand hygiene guidelines. For pathogens to be transmitted from one patient to another via the hands of the healthcare worker the following chain of events must occur. First the organism must be present on the patient’s skin and the hands of the healthcare worker must come in contact with the organism. Second the organism must be able to survive for several minutes on the hands of the health care worker. Third the handwashing by the healthcare worker was inadequate or omitted, or the type of cleansing agent was unsuitable. Fourth the contaminated hands of the healthcare worker must come in contact with another patient. If the healthcare worker’s hands are visually soiled, particularly with body fluids, soap and water should be use for handwashing. Medication errors can occur in any healthcare setting as well as the home. Medication errors may result from errors in prescribing, transcribing, communication, packaging and labelling, distribution and other practices. There are three medication safety issues identified by the Joint Commission, National Patient Safety Goals as a concern: labeling of medications, anticoagulant therapy, and medication reconciliation. The way medications are labeled and packaged can lead to medication errors. 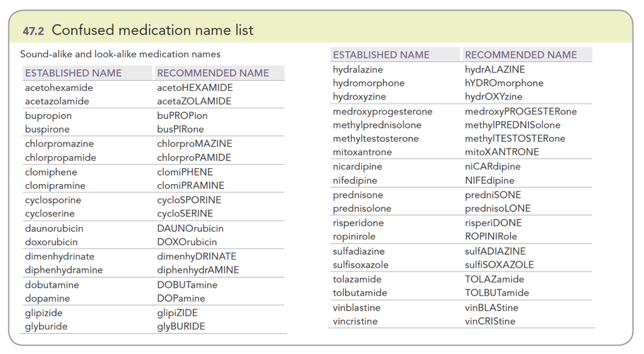 Labels may cause confusion leading to errors when the following situations occur: (a) marketing distractions, (b) labels or drug names look alike, (c) drug names are the same but the drugs have different purposes, (d) information on the label maybe difficult to find, and (e) warning information may be hidden. A manufacture may want to draw attention to its product by using eye catching adjectives or phrases causing distractions for the consumer. Drugs may come in different forms (ex: capsules, gel tabs) and in different strengths, however, the drug companies often package them in containers that look alike. At times when a drug company has a well-known brand name for one product they will introduce a new product under the same name. The two products may treat different medical conditions (ex: stool softener vs laxative). Important information about a drug may be located underneath the label. The label reads “peel back” causing individuals not to notice the instructions or to think they cannot peel back the label without buying the drug. Finally, warning information regarding a fact about a drug, such as allergic ingredients, might be located in a less obvious place on the medication container leading individuals to miss the information or become confused. Anticoagulant drugs (ex: Pradaxa®, Xarelto®, Eliquis® and Coumadin®) are widely used for both treatment and prophylaxis of thrombotic and are some of the drugs that most frequently cause adverse medication incidents in hospitals. Admission, discharge and surgery were found to be the times adverse incidents frequently occurred. Studies have shown that during admission and surgery, prescribing excess anticoagulant was the most frequent problem. During discharge, prescribing insufficient anticoagulant was the most frequent problem. Management of anticoagulant therapy involves being aware of the difference between bleeding caused by over-dosing and clotting caused by under-dosing. Both conditions can be fatal. Medication reconciliation is the process of creating an accurate list of all medications a patient is taking to avoid errors. 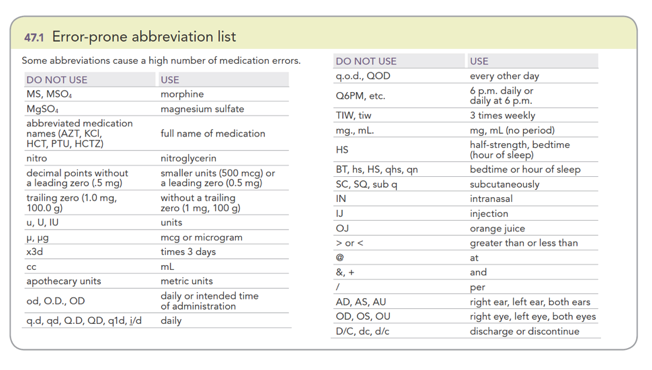 The medication list needs to include drug name, dosage, frequency and route. To assure the correct medications are administered the medication list needs to be compared to the physician’s orders at the time of admissions, when transferred from one hospital unit to another, and at the time of discharge. Errors that have the potential of occurring when medication reconciliation is implemented are: omitting a particular medication, giving the medication more than once, giving an incorrect dose and/or causing a drug interaction. Any of the above medication errors can lead to a sentinel event causing the healthcare organization to implement a root-cause-analysis to determine the cause(s). The following diagram depicts an example of a root-cause-analysis as identified by the Joint Commission Sentinel Event Alert #41 for safety of using medications. Every medication has the potential to cause adverse effects. These are undesired, inadvertent, and harmful effects of the medication. Adverse effects can range from mild to severe, and some can be life‑threatening. Medications are chemicals that affect the body. With concurrent use of medications, there is a potential for an interaction. Medications can also interact with foods and dietary supplements. Contraindications and precautions for specific medications are conditions (diseases, age, pregnancy, lactation) that make it risky or completely unsafe for clients to take them. Anticipation of adverse effects, interactions, contraindications, and precautions is an important component of client education. Both the nurse and the client should know the major adverse effects a medication can cause. Early identification of adverse effects allows for timely intervention to minimize harm. Employing The 10 Rights of Safe Medication Administration can facilitate the prevention of medication errors. Verify clients’ identification before each medication administration. The Joint Commission requires two client identifiers. Acceptable identifiers include the client’s name, an assigned identification number, telephone number, birth date, or other person‑specific identifier, such as a photo identification card. Nurses also use bar‑code scanners to identify clients. Check for allergies by asking clients, checking for an allergy bracelet or medal, and checking the MAR. Correctly interpret medication prescriptions, verifying completeness and clarity. Read medication labels and compare them with the MAR three times: before removing the container, when removing the amount of medication from the container, and in the presence of the client before administering the medication. Leave unit‑dose medication in its package until administration. Use a unit‑dose system to decrease errors. If not available, calculate the correct medication dose; check a drug reference to make sure the dose is within the usual range. Ask another nurse to verify the dose if uncertain of the calculation. Prepare medication dosages using standard measurement devices, such as graduated cups or syringes. Some medication dosages require a second verifier or witness, such as some cytotoxic medications. Automated medication dispensing systems use a machine to control the dispensing of medications. Administer medication on time to maintain a consistent therapeutic blood level. It is generally acceptable to administer the medication 30 min before or after the scheduled time. Refer to the drug reference or the facility’s policy for exceptions. The most common routes of administration are oral, topical, subcutaneous, intramuscular (IM), and intravenous (IV). Additional administration routes include sublingual, buccal, intradermal, transdermal, epidural, inhalation, nasal, ophthalmic, otic, rectal, vaginal, intraosseous, and via enteral tubes. Select the correct preparation for the route the provider prescribed (otic vs. ophthalmic topical ointment or drops). Immediately record pertinent information, and include the client’s response to the medication. Document the medication after administration, not before. Inform clients about the medication: its purpose, what to expect, how to take it, and what to report. To individualize the teaching, determine what the clients already know about the medication, need to know about the medication, and want to know about the medication. Respect clients’ right to refuse any medication. Explain the consequences, inform the provider, and document the refusal. Collect any essential data before and after administering any medication. For example, measure apical heart rate before giving digoxin. Follow up with clients to verify therapeutic effects as well as side and adverse effects. Between January 2005 and June 2008, the Federal Drug Administration (FDA) reported 560 alarm related deaths. This is significantly more than the 98 voluntarily reported 98 alarm related events to the Joint Commission, with 80 deaths and 13 with permanent loss of function between January 2009 and June 2012. The most commonly identified contributing factor was failure to respond to alarms when they sounded. This may be difficult to understand until one realizes that a single patient care unit may have more than 100 alarm signals in a single shift. 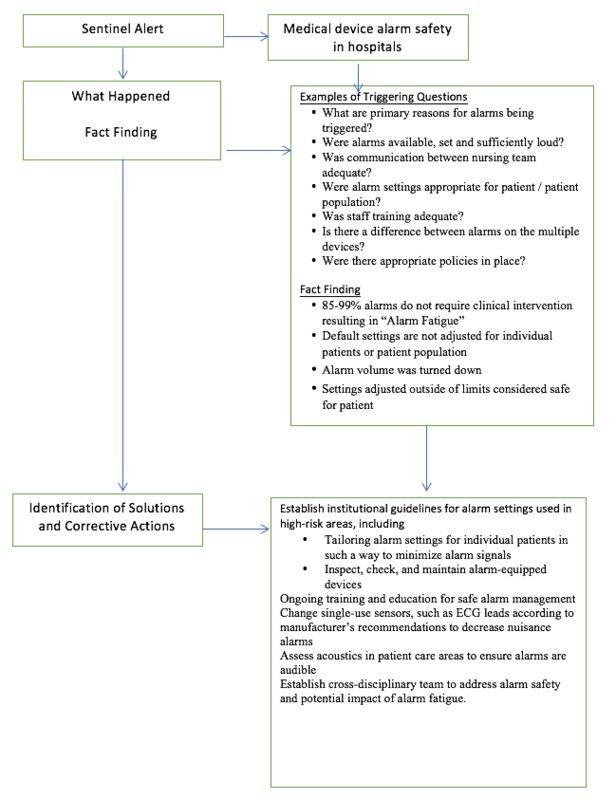 The review of data associated with medical errors related to medical device alarms demonstrates a significant human error component. There are numerous devices that provide appropriate alarm systems if they were used independently of other devices, the staff understood the parameters of the alarms, and if settings were appropriate to the patient population. Medical device alarms can lead to a sentinel event causing the healthcare organization to implement a root-cause-analysis to determine the cause(s). The following diagram depicts an example of a root-cause-analysis as identified by the Joint Commission Sentinel Event Alert #50 for medical device alarm safety. The prevention of injury related to the use of medical devices equipped with alarms falls primarily to the reduction of the chance of human error through training, technology, monitoring, and increased awareness. Institutions must demand that manufacturers of devices provide a variety of sounds so that alarms can be set to be distinguishable. An assessment of unit acoustics with correction of impediments to sounds being clearly heard must be conducted at the institutional level. Multidisciplinary teams, including experts on human behavior, should be used to create policies and processes for setting and monitoring alarms at the initiation of device use and during hand-off communications. Settings for specific patient populations should be identified and communicated for patient-care units and processes established for reviewing indications for individualized settings. For example, an adjustment to the preset delay of a pulse oximetry monitor from 5 seconds to 10 seconds will decrease alarms caused by movement and temporary oxygen changes. Mistakes are expected in any situation involving humans, it could even be considered inevitable when considering that humans are involved in the performance of more than 200 million surgeries annually around the world. This is not to imply that errors are acceptable, but to recognize that it is unrealistic to set a goal of preventing all errors. We should, however, expect that we should be able to limit surgical errors. Several initiatives have been implemented since 2005 by national and international organizations such as the Institute for Healthcare Improvement (IHI), the Joint Commission, and the World Health Organization (WHO) yet sentinel or adverse events related to surgical procedures continues to be high. Analysis of data has identified that often these events have their root causes in errors occurring prior to or after the procedure rather than mistakes made during the operation itself. Contributing factors include a breakdown in communication within and amongst the surgical team, other care providers, patients and families; errors or delays in diagnoses; and delays or failure to treat. The decision on when to operate and when to pursue non-operative treatment is a challenging one for surgeons. Examples of significant types of errors that occur in the surgical setting and requiring both inpatient and outpatient systems of prevention and culture of patient safety include infection, wrong patient, wrong procedure, wrong site, unintended foreign objects. Many of the contributing or causative factors have been shown to be similar by root cause analysis, yet processes to prevent them will vary. The “Time-Out” used in prevention of errors related to right patient, right procedure, and right site is not the process that would be effective in prevention of contamination of fields or avoiding leaving a surgical instrument in a patient. Surgical errors can lead to a sentinel event causing the healthcare organization to implement a root-cause-analysis to determine the cause(s). The following diagram depicts an example of a root-cause-analysis as identified by the Joint Commission Sentinel Event Alert #51 involving the prevention of untended retained foreign objects. If errors are inevitable, what are we to do? Like many other patient safety measures, there must be a culture that recognizes that human errors occur and a well-designed system in place, based on scientific evidence, to prevent them from occurring, and recognizing and remedying them when they do occur. These processes should be developed using a multidisciplinary approach that includes experts in human behavior and contain checks and balances to ensure that errors are more likely to be caught before they happen and that blame does not rest upon an individual. Ideally, the structure is comparable to a stack of Swiss cheese slices. The holes represent opportunities for a process to fail, and each of the slices can be seen as a defensive layer in the process. An error may allow a problem to pass through a hole in one layer, but if the next slice has its holes in a different place, and the error can be stopped or caught. Each layer would work as a defense against potential error impacting the outcome. The more number of defenses, the fewer and the smaller the holes, the more likely you are to catch and stop errors that may occur. The American Nurses Association’s Magnet Recognition program and the National Patient Safety Goals for 2017 include falls as one of the core indicators of performance. Hospitals have devoted quality improvement and research efforts to prevent falls, but patient falls continually constitute the largest single category of self-reported adverse events in acute care facilities. Falls resulting in injury are a significant patient safety problem. Although the elderly and frail patients are long acknowledged fall risks, it is important to recognize that medical conditions, medications, surgery, and medical and diagnostic procedures can cause patients of any age or physical ability to be at risk for a fall. According to the Joint Commission, hundreds of thousands of patients fall in hospitals in the United States each year, with 30-50 percent resulting in injury. The Agency for Healthcare Research and Quality (ARQH) has indicated that this number can be as high as 1 million falls each year, 1/3 of which are preventable. Falls with injuries such as fractures, lacerations, and internal bleeding result in an average cost of about $14,000. Since falls are identified as a category under the Hospital Acquired Condition (HAC) regulations that became effective in October 2008, hospitals do not receive payment for treating injuries caused by falls that occur in the hospital. The incidence of falls with injury is even greater in nursing homes. The Center for Disease Control (CDC) estimate that 50 – 75% of nursing home residents fall at least one time each year. This is twice the incidence of falls for persons over 65 living at home. “Falls with serious injury are consistently among the Top 10 sentinel events reported to The Joint Commission’s Sentinel Event database, which has 465 reports of falls with injuries since 2009. Majority of the falls voluntarily reported occur in hospitals. Approximately 63 percent of these falls resulted in death, while the remaining patients sustained injuries. In addition, the ECRI Institute, a non-profit agency that conducts evidence-based research, reports a significant number of falls occurring in non-hospital settings such as long-term care facilities.” (2015). Community fall prevention campaigns are also conducted by organizations due to the high risk of falls resulting in injury in older adults. The National Council on Aging (NCOA) has identified the following as factors contributing to the susceptibility of older adults to falls and injury. Falls can lead to a sentinel event causing the healthcare organization to implement a root-cause-analysis to determine the cause(s). The following diagram depicts an example of a root-cause-analysis as identified by the Joint Commission Sentinel Event Alert #55 for falls. Preventing falls involves diligence and constant awareness of potential risks. Assessment of all patients for risk factors for falls and injury should be conducted routinely and communicated with all members of the team. Training on use of tools and monitoring of policy compliance is essential. Attention to the institution’s physical design focuses on space, floor surfaces, lighting, furniture placement, hand rails, and accessibility of supplies and belongings. To date hospitals and nursing homes have not been successful in significant or sustained reduction in falls. Research on fall prevention and reduction indicates that the process may be complex. It appears that the use of a standardized assessment tool to identify fall and injury risk factors provides the greatest contribution to successful prevention plans. Institutions can obtain evidence-based assessment tools from organizations that make many resources for patient safety available such as the Agency for Healthcare Research and Quality (AHRQ), ECRI Institute, Institute for Healthcare Improvement (IHI), Institute for Clinical Systems Improvement (ISCI), the Joint Commission Center for Transforming Healthcare, and the US Department of Veteran Affairs National Center for Patient Safety. An interdisciplinary approach is required to effectively reduce the number of falls in acute, ambulatory, long term care health care facilities and involves both routine and patient specific measures. Health care providers must look to prevent falls while remembering considerations as minimizing physical and chemical restraints, maintaining the patient’s mobility and independence, and providing excellent patient care. Fall prevention programs, like the CDC’s Stopping Elderly Accidents, Deaths, and Injuries (STEADI) can be successfully integrated into ambulatory care settings with planning, training and support. Fall prevention activities for in-patient settings should include the following. Raise awareness of the need to prevent falls resulting in injury. Require individual plans of care based on identified fall and injury risks with interventions specific to the patient, the population, and the setting. Post-fall management including ongoing reassessment of the patient, honest and transparent reporting, post-fall brainstorming (huddle), trending and analysis of the falls for improvement of fall prevention plan. According to the World Health Organization (WHO), the annual death toll by suicide reaches almost 800,000 while another 65,000 people attempting suicide and still others think about suicide by death. The Joint Commission’s Sentinel Event Alert # 56 indicates that suicide is the 10th leading cause of death in the United States. Although most persons who die by suicide, adult, adolescent, and child, receive health care services for related or unrelated issues in the year prior to their death, care providers often do not detect suicidal thoughts. Assessing suicide risk remains a challenge The Joint Commission’s Sentinel Event database has reports of 1,089 suicides occurring from 2010 to 2014 among patients receiving care in a staffed around-the-clock health care setting, including a hospital emergency department or within 72 hours of discharge. A failure in assessment was the most commonly documented root cause. The Joint Commission identified that 21.4% of accredited behavioral health organizations and 5.14% of accredited hospitals were non-compliant in 2014 with National Patient Safety Goal 15.01.01 Element of Performance 1 – Conduct a risk assessment that identifies specific patient characteristics and environmental features that may increase or decrease the risk for suicide. Presently, health care organizations and communities lack adequate suicide prevention resources, which lead to a decrease in detection and treatment rate of people at risk. Suicides can lead to a sentinel event causing the healthcare organization to implement a root-cause-analysis to determine the cause(s). The following diagram depicts an example of a root-cause-analysis as identified by the Joint Commission Sentinel Event Alert #55 for suicide. Health care providers in primary, emergency and behavioral health facilities hold important roles in detecting suicide ideation in acute or non-acute care settings. Assessment findings are used to determine the level of safety measures required. The Joint Commission recommends the following three steps in detecting patients at risk. Review each patient’s personal and family medical history for suicide risk factors. Screen all patients for suicide ideation, using standardized, evidence-based screening tool. When assessment indicates, act immediately. It literally should be considered a life or death matter. It ought to be noted that HIPPA allows a clinician to contact a patient’s friends, families, or treatment facilities to verify findings when the patient denies or minimizes suicide risk or declines treatment. One-on-one observation in a safe health care environment is essential for patients assessed to be an acute suicidal threat. Personal and direct referrals and provisions of linkages to outpatient behavioral health and other providers for follow-up care within one week of initial assessment should be expected. It should not be left up to the patients to make their own appointments. All patients with suicidal ideations and their family members, should be given the number to the National Suicide Prevention Lifeline, 1-800-273TALK (8255), as well as to local crisis and peer support contact. Keep these patients away from anchor points for hanging and material that can be used for self-injury, such as bandages, sheets, restraint belts, plastic bags, elastic tubing and oxygen tubing. This includes screening of visitors. Conduct safety planning collaboratively with the patient to identify possible coping strategies. Resources for reducing risks should be identified and given to the patient. Evidence indicates that a “no-suicide contract” does not prevent suicide and is not recommended by experts in the field. The details of the safety plan should be reviewed with the patient at every interaction until the patient is no longer considered at risk for suicide. Restrict access to lethal means. Lethal means vary but can include firearms, knives, prescription medications and chemicals. Discuss with family members or significant other ways of removing or locking up firearms, possible weapons, medications, and chemicals. Health care institutions, of all types, should keep medications, chemicals, supplies, and equipment secured. Additional recommendations from the Joint Commission address behavioral health treatment and discharge. It is essential that evidence-based treatments and discharge plans are implemented, and transition and follow-up care is well coordinated with all providers. Establish a collaborative, ongoing, and systematic assessment and treatment process with the patient involving the patient’s other providers, family and friends as appropriate. Develop treatment and discharge plans that are specific and directly target suicide prevention. Post-discharge prevention includes evidence-based interventions which emphasize patient engagement, collaborative assessment and treatment planning, problem-focused clinical intervention skills training, shared service responsibility, and proactive and personal clinician involvement in care transitions and follow-up care. Final recommendations for education and documentation apply to all care providers and settings. Community awareness of the prevalence of suicide and efforts to reduce its incidence are highlighted in the World Suicide Prevention Day and Suicide Prevention Awareness week. Organizations that join the efforts to conduct research, increase awareness of mental health issues and suicide, and make resources for suicide prevention available include the National Institute of Mental Health (NIMH), the American Foundation for Suicide Prevention, the National Alliance of Mental Illness (NAMI), the Center for Disease Control (CDC), the QPR institute, National Action Alliance for Suicide Prevention. According to the Joint Commission, the leadership of each health care organization is accountable for creating and maintaining an environment that is safe for patients, employees and visitors. Competent leaders recognize that systemic flaws or weaknesses exist in every organization and despite policies, protocols, and training, the potential for errors exist because humans make mistakes. Leadership failure is a contributing factor to many types of adverse events, such as ineffective hand-off communication, wrong site surgery, and delays in treatment. Without an environment of safety and organizational support and monitoring, the creation of policies or purchase of state of the art technology will not significantly reduce the number of adverse incidents or near misses. 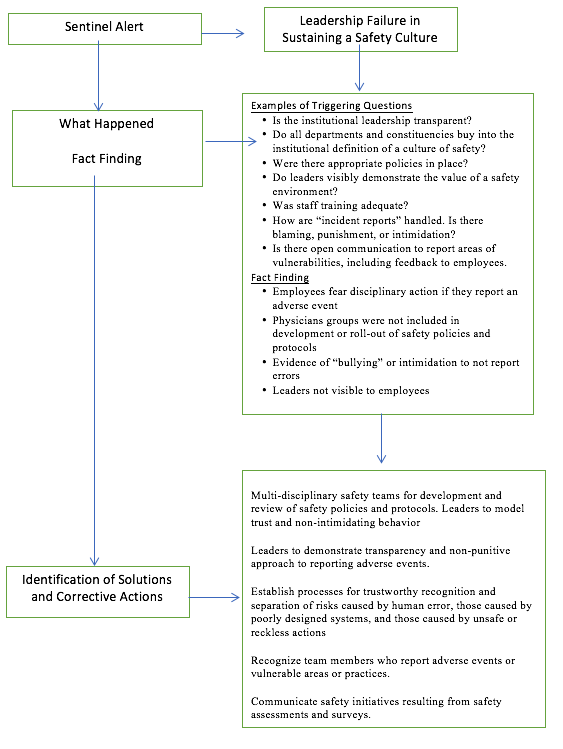 An environment of safety requires health team members to openly communicate, question, and confront someone who may hold a higher rung on the institutional hierarchy. For example, the surgical technician or circulating nurse must be free to interrupt a surgery because of perceived contamination, wrong site, or wrong count. It takes sufficient time, space and planning for a change of shift report that includes pertinent information and encourages questions in a quiet and interruption free environment. Leaders make the organizational goals and values, including those related patient safety, visible through every day actions. Inconsistencies between words and actions result in the inability to achieve stated goals. It is critical that leaders commit to behavior that accurately reflects a true culture of safety. No amount of resources or policies can effectively create and maintain an environment as is done by effective leadership. The organizational culture reflects actions that occur day in and day out. Organizations with a quality safety culture have leaders who are deliberate in actions to address safety issues. They are able to see safety issues as potential systemic problems, not problems with the employees, and see adverse events and near misses as providing “information-rich” data for analysis and systems improvement. Poor leadership does not present itself as a reported sentinel event but as a contributing or root cause to reported sentinel events. To prevent future adverse events, the leadership failures must also be examined in the same way as a sentinel event. Leadership failure can lead to a sentinel event causing the healthcare organization to implement a root-cause-analysis to determine the cause(s). The following diagram depicts an example of a root-cause-analysis as identified by the Joint Commission Sentinel Event Alert #57 for leadership failure. Within a successful organization, people are encouraged, even rewarded, for providing essential safety-related information. Processes should clearly differentiate between human error and at risk or reckless behaviors. A culture that encourages people to self-report their errors and near-misses without punishment creates an atmosphere where consequences of errors can be minimized, and systemic problems identified early. Treating everyone with dignity and respect is essential to the development of a safe and effective environment. This then leads to an environment that can be characterized by employees who are engaged, productive and collaborative. An organization must focus on grooming and training its leadership team in the areas of 1) institutional values for a culture of safety, 2) leadership skills, and 3) organizational communication. Transparency and accountability must be expected at all levels of the leadership team. Feedback from all members of the organization should be sought out and integrated into the analysis of organizational safety systems. It is critical that leaders be open to hear the feedback and use it for improvement. The Joint Commission has made the following suggestions in their Sentinel Event Alert #57 for a leadership that supports building a culture of safety. Absolutely crucial is a transparent, non-punitive approach to reporting and learning from adverse events, close calls and unsafe conditions. Establish clear, just, and transparent risk-based processes for recognizing and separating human error and error arising from poorly designed systems from unsafe or reckless actions that are blameworthy. To advance trust within the organization, CEOs and all leaders must adopt and model appropriate behaviors and champion efforts to eradicate intimidating behaviors. Establish, enforce and communicate to all team members the policies that support safety culture and the reporting of adverse events, close calls and unsafe conditions. Establish an organizational baseline measure on safety culture performance using the Agency for Healthcare Research and Quality (AHRQ) Hospital Survey on Patient Safety Culture (HSOPS) or another tool, such as the Safety Attitudes Questionnaire (SAQ). Effective hands-off communication can be complex and failures in this area have long been considered a significant contributing factor to sentinel events. As such, it was addressed in the National Patient Safety Goals in 2010. Despite this goal, a study of the Commission’s sentinel event data bases published in 2016 estimated that communication failures contributed to 30 percent of malpractice claims and 1,744 deaths over 5 years. The enormity of this issue is evident by the fact that health care providers in a typical teaching hospital may conduct at least 4,000 hand-offs each day. Poor hand-off communication has been attributed to the following root causes through a project enacted in 10 hospitals called the Robust Process Improvement: delays, inattention, lack of knowledge, lack of time, poor timing, interruptions, distractions, and lack of standardized procedures. Institutions have significantly reduced ineffective hand-off communication and related adverse events by using a variety of communication tools such as evidence-based checklists, including tools using mnemonics, such as SBAR tool (Situation, Background, Assessment, Recommendation) and I-PASS (Illness severity, Patient summary, Action list, Situation awareness and contingency plans, synthesis by receiver). The Joint Commission has provided “8 Tips for High Quality Handoffs” to assist care givers in making high quality hand-offs. A brief synopsis of the tips from Sentinel Alert issue #58 is below. Determine the critical information that needs to be communicated. Use standardized tools to communicate. Do not rely only on electronic or paper communication. Face-to-face or phone communication allows for the receiver to ask questions and seek clarification. Combine information from multiple sources and communicate at one time. Hand-off communication to take place in a designated “zone of silence” free from non-emergency interruptions. Include all team members in hand-off and, if possible, the patient and family members. Use electronic health records and other technologies to enhance communication, but do not rely on them on their own. Communication is often determined to be the root-cause of a variety of sentinel events, not initially seen as the sentinel event itself. Analysis communication must be completed in order to determine how to make patient care safer. Nurses make great efforts to deliver safe and effective care only to create unsafe conditions through incomplete or inaccurate communication when delivering responsibilities of care to another professional. Hand-off communication can lead to a sentinel event causing the healthcare organization to implement a root-cause-analysis to determine the cause(s). 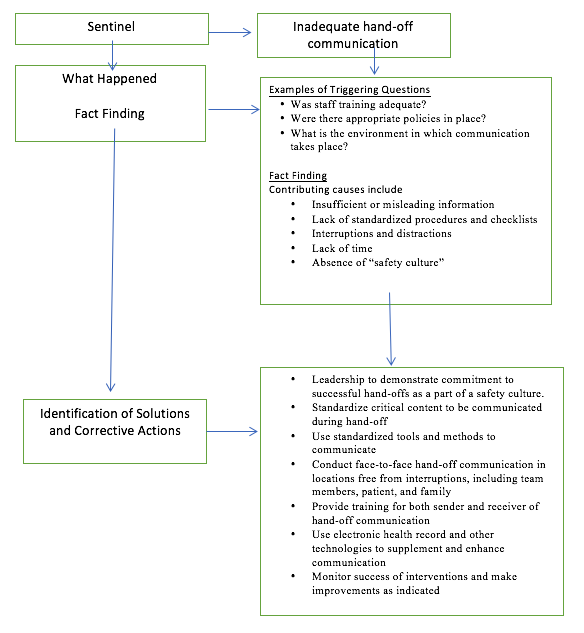 The following diagram depicts an example of a root-cause-analysis as identified by the Joint Commission Sentinel Event Alert #58 for inadequate hand-off communication. Effective communication needs to be supported throughout any organization. It requires sufficient time, staffing, space, standardized tools and expectations, and the encouragement of questioning in a safe environment. Multi-disciplinary teams should develop the protocols and tools for guiding communication between departments and disciplines. Protocols should favor face-to-face hand-offs, provide for quiet, uninterrupted environments, participation of team members, including the patient, and use of standardized tools to guide communication. Education and training should include role play sessions and follow-up monitoring for all members of the health provider team. Errors in correctly identifying patients can occur in any aspect of an individual’s involvement in the healthcare system, such as clinical care, medication administration, or billing. Patient identification mistakes occur in every type of healthcare setting, from hospitals to walk in clinics, to doctors’ offices. Healthcare providers often feel that they cannot make such an error. Most patient identification mistakes are usually caught before patients are harmed. However, research has shown that enough incorrect patient identification errors leading to temporary or permanent harm or death to an individual have occurred. The Joint Commission in 2014 decided that improving the accuracy of patient identification as one of its National Patient Safety Goals. Three problems have been connected to playing a role in the cause of patient identification errors: (1) the institution does not have formal policies, (2) existing policies are not followed, and (3) the intention of the policy is inadequate. When policies do exist, the reasons most often given for staff not complying with the policy was time constraints, language barriers, and use of yes/no questions. Patient identification errors most commonly occur in the following areas: (a) registration, (b) wristband accuracy and use, (c) order entry and charting, (d) medication administration, and (e) surgery. How does each one of these areas contribute to identification errors? Registration processes can lead to misidentification as many healthcare facilities do not require a photo ID for inpatient or outpatient registration. Wristbands may be missing or have incorrect or incomplete information on them. In addition, poor wristband design such as the wrong size or print illegibility can lead to misidentification. Some examples of causes for missing wristbands are: wristbands falling off, removed by the patient or staff, never put on the patient. Wristband design can be problematic for children as the wristbands can be too large and easily come off. Order entry and charting factors leading to misidentification errors are writing orders on the wrong patient’s chart and software issues with function and/or design. One of the most common patient misidentification errors in medication administration is not following patient ID protocols. Research suggests that compliance with identification of patient protocols when administering medications was higher among new nurses than with more experience nurses. Wrong-site/wrong-patient are the common problems associated with patient identification errors around surgery. They appear to be due to communication errors or system errors. The errors are often attributed to the diagnosis process when incorrect medical record, radiographs, or laboratory samples are used. Any of the above patient misidentifications can lead to a sentinel event causing the healthcare organization to implement a root-cause-analysis to determine the cause(s). 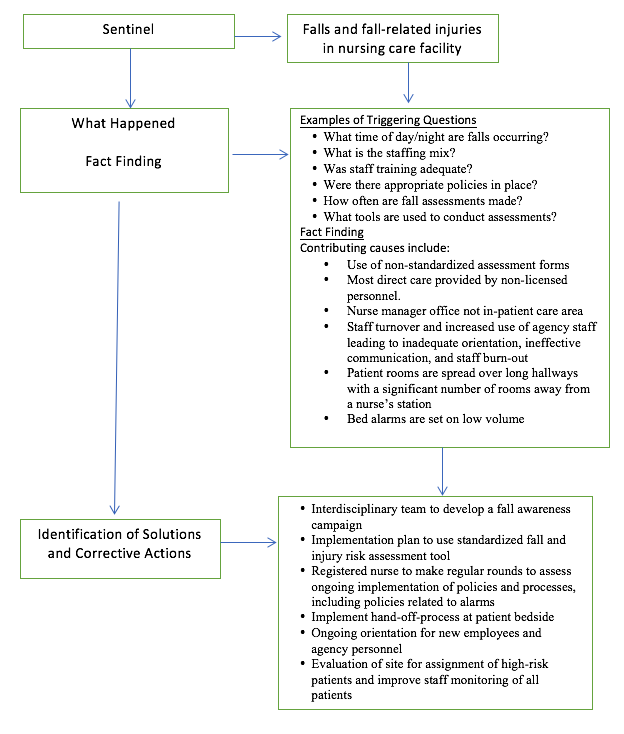 The following diagram depicts an example of a root-cause-analysis as identified by the National Patient Safety Goals as Goal #1 for patient identification. The Goal for improving the accuracy of patient identification is to reliably identify the individual for whom the treatment is intended and to match the treatment to the individual. Two primary ways that this can be done is first by using two patient identifiers when administering medications and blood, when collecting specimens for testing, and when carrying out treatments. The second approach is to label containers used for blood and other specimens in front of the patient. In addition to the two performance indicators established by the Joint Commission other recommendations need to be considered in improving identification of patients. The healthcare organization needs to establish standardized approaches for patient identification, particularly within healthcare systems. Policies need to be established and followed. Policies particularly need to be developed for identifying non-verbal patients and patients with the same name. When addressing the patient avoid questions with yes/no answers. Patients may not have heard the question or may not have understood the question but be embarrassed to say that and answer the question with a yes. Education is an important factor in preventing patient identification errors and needs to be incorporated into orientation and continuing education for all employees. Involving the patient and family members in the educational process by teaching them the risks involved in misidentification is also important. Nurses play a very significant role in patient safety by assisting to reduce medical errors and minimizing adverse and sentinel events. They do this by identifying, interrupting and correcting errors. Nurses at the bedside remain the primary safeguard against situations occurring that would adversely affect patients. Nurses are in a position to turn potentially adverse outcomes into “near-miss events vs sentinel events. Nurses’ have a strong commitment to creating safe environments for patients. Nurses used several strategies to identify, interrupt and correct medical errors. Examples of strategies used by nurses in their role of identifying errors are: knowing the patient, knowing the plan of care, surveillance, knowing policies and procedures, and double checking. Knowing the patient involves developing a relationship with the patient and family members, being knowledgeable about the patient’s medical history, maintaining continuity of care and communicating with team members. The plan of care strategy involves developing a comprehensive plan of care and communicating the plan of care to others, for example during change of shift report or during patient rounds. Surveillance strategy involves systematic and ongoing observation of the patient and the patient’s environment. Another strategy nurses use in preventing medical errors is knowing and interrupting the nursing unit and institution’s policies and procedures. It is not uncommon for nurses to use the strategy of double checking physician orders or interventions with other nurses to be sure the order or intervention is appropriate and/or makes sense. Interrupting errors is another aspect of the nurse’s role in preventing medical errors. A nurse’s experience and confidence level influenced s/he ability to interrupt errors. Nurses use three methods most often when interrupting errors: offering assistance, clarifying, and verbally interrupting. Offering assistance is seen as a nonthreatening and support approach to telling someone that they are about to make a mistake. It allows the nurse to approach the individual in a helpful manner vs a confrontational manner. Another method is clarifying. When a nurse is unsure for example of a physician’s order, or an aspect of the plan of care asking for clarification often resolves the situation. Asking the question “why” is a tactful way of interrupting an error. When the potential for a sentinel event is great, verbally interrupting the action is often the best method for the nurse to use. When using this method, it is important for the nurse to use an approach that does not embarrass the individual or case the patient anxiety. Correcting medical errors is when the nurse intervenes because identifying or interrupting errors was not successful and additional intervention is necessary. This third strategy deals with persevering, being physical present, reviewing the plan of care, and referring to standards or experts. Nurses will give their complete attention to the error and will follow up until answers or patient needs are met. When prior attempts to correct the potential medical error fails nurses will utilize the strategy of being physical present. The nurse will engage in face to face interactions with the individuals involved, whether a physician or other team member. Clarification by the nurse of a patient’s plan of care is essential to providing safe patient care. When the nurses’ senses there has been an omission or commission in the plan it is her/his responsibility to raise questions. The last example of a strategy the nurse may use in correcting errors is using available resources such as: referencing institution/nursing unit policies or accreditation/regulatory agency standards or current literature. Citing information from an expert the nurse can help the individual understand the potential error in a constructive way. In addition to the above three strategies for reducing medical errors nurses can play a role in preventing errors by actively being involved in various activities that reach across all members of the healthcare team as well as the patient and family member. Education is a key component in preventing medical errors. Nurses can be involved in teaching team members as well as patients about current best practices. The nurse can be instrumental in developing agency policies and procedures by serving on agency committees that set policy and procedures. In her/his leadership role the nurse can help team members effectively communicate clearly about patient care needs. Technology, particularly informatics, has contributed to efficiency, effectiveness, and accuracy in reporting and preventing medical errors. Computerization has been used to prevent errors through such items as: barcoding and electronic health records, interconnections. Nurses who focus on each patient, identify breaks in care processes and seek solutions, employ best practices and participate in lifelong learning will be performing a significant role in reducing medical errors and providing a safe environment for patients. James, J.T. (2013). A new, evidence-based Estimate of Patient Harms Associated with Hospital Care. Journal of Patient Safety, 9 (3), 122-128. doi: 10.1097/PTS.0b013e3182948a69. Retrieved November 15, 2017. Agency for Healthcare Research and Quality (2017) 20 Tips to help prevent medical errors: Patient fact sheet. Retrieved October 11, 2017. Joint Commission. (2017). Patient safety systems. Retrieved October 12, 2017. Joint Commission (2017) Sentinel event alert 57: The essential role of leadership in developing a safety culture. Retrieved October 10, 2017. Miller-Hoover, S. (2017). .
RN.COM AMN Healthcare Education Services (2017). Medical error reduction a key to quality care. RN. Retrieved October 10, 2017. Potter, P. A., Perry, A. G., Stockert, P., & Hall, A. (2017). Fundamentals of nursing (9th ed.). St. Louis, MO: Elsevier. U.S. Department of Health & Human Services. (2017). Patient safety and quality improvement act of 2005 statute and rule. Retrieved October 11, 2017 . Warren, D., & Hudson, S. (2017). Prevention of medical errors. National Center of Continuing Education. Retrieved October 10, 2017. .
Joint Commission (2017) Sentinel Event Alert 57: The essential role of leadership in developing a safety culture. Retrieved October 10, 2017. Berman, A., Snyder, S., & Frandsen, G. (2016). Kozier & Erb’s Fundamentals of nursing: Concepts, process, and practice (10th ed.). Upper Saddle River, NJ: Prentice-Hall. Joint Commission. (2017). Sentinel events. Retrieved October 12, 2017. Agency for Healthcare Research and Quality Patient Safety Primer (2017). Root Cause Analysis. Retrieved December 1, 2017. Joint Commission Resources. (2015). Root cause analysis in health care: tools and techniques. 5th Ed. Retrieved October 16, 2017. Joint Commission Universal Protocol. (2017). Facts about patient safety. Retrieved November 17, 2017. National Patient Safety Foundation. (2016). RCA2 Improving root cause analysis and actions to prevent harm. Retrieved October 16, 2017. Vallerand, A. H. & Sanoski, C. A., (2017). Davis’s Drug Guide for Nurses. 5th Ed. Catheter-associated Urinary Tract Infections (CAUTI. (2017). Office of Disease Prevention & Health Promotion. Retrieved November 6, 2017. Hand Hygiene in Healthcare Settings. (2017). Center for Disease Control. Retrieved October 29, 2017. Healthcare-Associated Infections-Health People 2020. Office of Disease Prevention & Health Promotion. Retrieved November 5, 2017. Joint Commission Resources. (2017). National Patient Safety Goals Effective January 2017. Retrieved November 17, 2017. Multidrug Resistant Organisms (MDROs). (2015). Memorial Sloan Kettering Cancer Center. Retrieved November 6, 2017. Multidrug-Resistant Organisms (MDROs): What Are They? (2016). Connecticut Department of Public Health. Retrieved November 6, 2017. Nall. R, (2016).What Is a Catheter-Associated Urinary Tract Infection (CAUTI)?. Healthline. Retrieved November 6, 2017. Overview: Healthcare-Associated Infections. Office of Disease Prevention & Health Promotion. Retrieved November 5, 2017. Strategies to Prevent Surgical Site Infections in Acute Care Hospitals: 2014 Update. Infection Control and Hospital Epidemiology (June 2017). Retrieved November 17, 2017. How labels, packages, and medicine names can cause confusion and error. (2014). Institute for Safe Medication Practices. Retrieved November 9, 2017. Karanjekar, R.V. & Shrotriya, R.J. (2015). 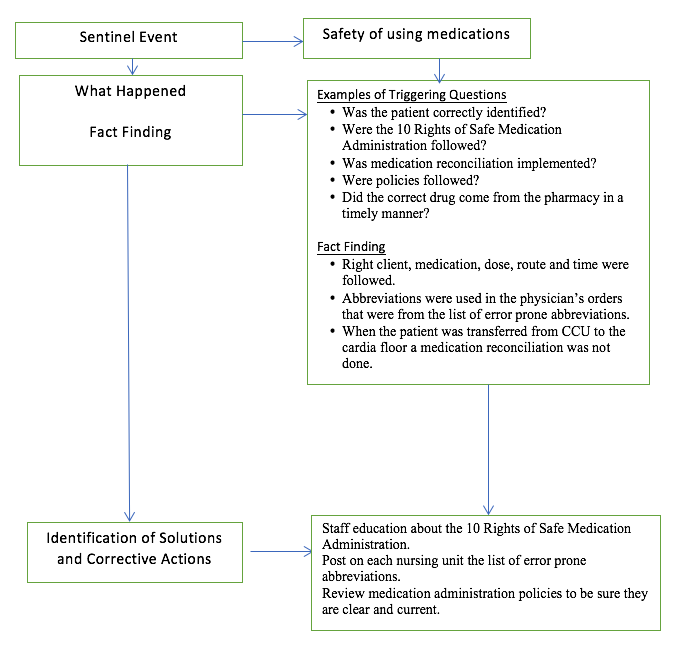 Patient Safety: Impact of Medication Errors. ASCI Journal of Management 44 (2): 17–30. Kavanagh, Caroline. (2017). Medication Governance: preventing errors and promoting patient safety. British Journal of Nursing. 26 (3): 159-165. Medication errors: Cut your risk with these tips. (2017). Mayo Clinic. Retrieved October 29, 2017. Medication Reconciliation to Prevent Adverse Drug Events. (2017). Institute for Healthcare Improvement. Retrieved November 9, 2107. Ensslin, P. (2014). Do you hear what I hear? Combatting alarm fatigue. American Nurse Today November 2014 Vol 9 No 11. Retrieved October 15, 2017. Joint Commission (2013). Sentinel Event Alert 50: Medical device alarm safety in hospitals. Retrieved October 15, 2017. Pelter, M., and Drew, B. (2015) Harm from alarm fatigue. Patient Safety Network. Retrieved October 15, 2017. Association of perioperative Registered Nurses. 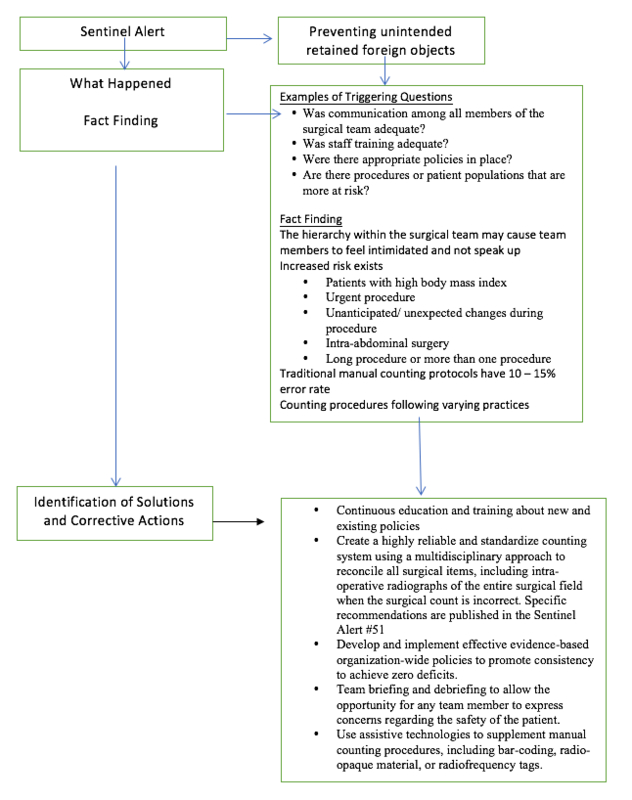 (2015) Position Statement: Preventing wrong-patient, wrong-site, wrong procedure events. Retrieved November 1, 2017. Association of perioperative Registered Nurses. (2017) Position Statement: Patient safety. Retrieved November 1, 2017.
wJoint Commission Resources. (2015). Root cause analysis in health care: tools and techniques. 5th Ed. Retrieved October 16, 2017. Joint Commission (2013). Sentinel Event Alert Issue 51: Preventing unintended retained foreign objects. Joint Commission Resources. Speak Up. Retrieved November 13, 2017. Kim, F., Donalisio da Silva, R., Gustafson, D., Nogueira, L., Harlin, T., and Paul, D. (2015). Current issues in patient safety in surgery: A review. Patient Safety in Surgery. Retrieved November 8, 2017. Agency for Healthcare Research and Quality. Preventing falls in hospitals. Retrieved November 12, 2017. Centers for Disease Control and Prevention, National Center for Injury Prevention and Control (2017). Important facts about falls. Retrieved November 12, 2017. Centers for Disease Control and Prevention, National Center for Injury Prevention and Control (2017). Stopping elderly accidents, deaths, and injuries. Retrieved November 12, 2017. Joint Commission (2015) Sentinel event alert 55: Preventing falls and fall-related injuries. Retrieved October 15, 2017. Center for Disease Control and Prevention (2017). Suicide risk and protective factors. Retrieved November 8, 2017. Joint Commission (2016). Sentinel Event Alert 56: Detecting and treating suicide ideation in all settings. Retrieved October 15, 2017. National Institute of Mental Health (2017). Suicide Prevention. Retrieved October 24, 2017. Springer, G. (2015). When and how to use restraints. American Nurse Today. Suicide.org. What is involuntary commitment? Retrieved November 10, 2017. Miller-Hoover, S. (2017). Medical error reduction a key to quality care. RN. Retrieved October 10, 2017. Oh, J., (2012). 6 elements of a true patient safety culture. Becker’s Hospital Review. Retrieved October 19, 2017. Dingley, C., Daugherty, K., Derieg, M. and Persing, R. (2017). Improving patient safety through provider communication strategy enhancements. Agency for Healthcare Research and Quality. Retrieved October 25, 2017..
Joint Commission (2017). Sentinel Event Alert 58 Inadequate handoff communication. Retrieved October 15, 2017. World Health Organization. (2017). World Health Statistics 2017. Retrieved November 20 2017. ECRI. (2016). Preventable, potentially fatal patient identification errors analyzed. ECRI Institute Retrieved October 17, 2017. Health Technology Assessment Information Services. (2016). Patient identification errors. ECRI Institute. Retrieved October 29, 2017. Joint Commission. (2007). Patient Identification. WHO Collaborating Center for Patient Safety Solution. Retrieved October 29, 2017. Lloyd, M. To ID or not to ID. Providence Health and Services. Retrieved October 29, 2017. Kennedy, M.S. (2017). Tracking Errors, Assessing Patients, Redesigning Processes—It’s All About Safe Care. AJN, 117 (10): 7. Zikhani,R. (2016) Seven-step pathway for preventing errors in healthcare, Journal of Healthcare Management, 61 (4): 271-281.